Safe streets advocates, family, and friends of Cheng Jin Lai gathered yesterday for a memorial service of the 78-year-old man who was killed by a Muni driver on October 18 while making a trip on his bicycle at the crash-prone intersection of Bryant, Division, and 11th Streets. The bicycle was Lai’s primary mode of transportation, “out of necessity and his passion,” said Mark Fong, an attorney for Lai’s family. Fong said Lai was making his regular trip from his home at a senior housing center in SoMa to deliver his and his family’s recyclables to a recycling center when he was hit by the Muni bus driver, who appeared to make a right turn into Lai’s path, though SFPD is still completing the crash investigation report. 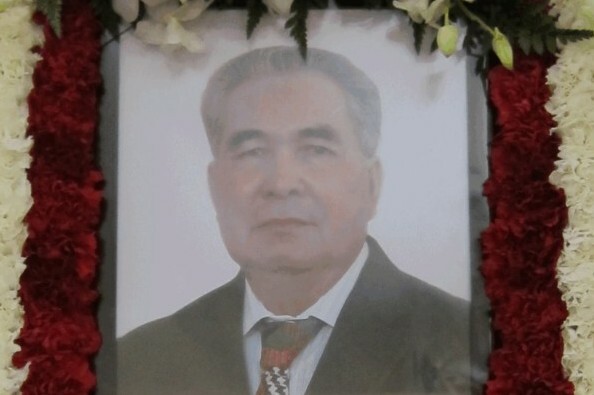 A retired Vietnam native who in 1996 moved to San Francisco from China with his wife of 60 years to live near his daughter, Lai became a U.S. citizen in 2003. Lai lived on a fixed income without a car, frequently traveling by bike to other neighborhoods like Chinatown and Fort Mason, where he loved to fish, said Fong and members of Lai’s family. “It’s pretty amazing — I hope I’m that healthy and active when I’m 78,” said Fong. Lai was the fourth bicycle rider to be killed on San Francisco streets this year — the third in SoMa (a fourth occurred in the Mission). All deaths appear to have been caused by drivers of trucks and buses who illegally made right turns into the victims, though none have been charged. The couple dozen who attended Lai’s memorial service included reps from community organizations like the Chinatown Community Development Center and the SF Bicycle Coalition. Supervisors Jane Kim and David Campos were also there. For the increasing number of San Francisco residents choosing to bike as an affordable, healthy way to get around, the odds are stacked against them, especially in downtown neighborhoods like SoMa, where streets are heavily designed for speeding motor traffic at the expense of safety, said SFBC Executive Director Leah Shahum. Meanwhile, more light is being shed on the entrenched bias against bicycle riders among many SFPD officers following the bungled crash investigation into the death of 24-year-old Amelie Le Moullac in August. Since Lai’s death, SF Weekly reporter Joe Eskanazi also discovered that the Muni bus involved in the crash lacked a required wheel guard, known as an S1-Gard, which might have saved Lai’s life by pushing him out of the way of the wheel that crushed him. The guards come standard issue on Muni buses, but apparently the agency routinely sent out buses without the guards. Only several days after SF Weekly’s reports were published did Muni management order a full wheel guard inspection of the 50 buses of the model type involved the crash (as opposed to all Muni buses), and order that any buses without the wheel guards be kept off the streets. In some ways it seems remarkable that a 78-year old would be riding his bicycle in San Francisco. But it needs to be our goal for this to be common and not end up as a tragedy. The desire is there. When my grandfather turned 80 my mom gave him a TV set to put in his kitchen. Hi promptly returned it and exchanged it for a bicycle and rode it till he was 87, till he was hit by a car. He continued on, even though the car ended up with a serious dent. But he wouldn’t ride anymore, solely because he realized that he didn’t have a safe place to ride. That is simply a failure on our part to create places that are safe and inviting for all. I have a Dutch co-worker who moved to the Bay Area from Rotterdam and biked everyday ever since he was 8 y.o. until he got right-hooked by a car and that was his last time on a bike. it’s a shame that our environment is not conducive for biking, a most enjoyable and simple contraption ever built for human beings. Very sad. Dear Rob Anderson et. al: Not every cyclist in SF is a young, white, rich, hipster male working in the tech industry. I’m not, Cheng Jin Lai is not, my boyfriend is not, and neither are most of my friends. We ride bikes because it’s an efficient, low-cost way of getting around and because there’s no need to drive a 2000lb hunk of metal that takes up 120+ sq ft of space in a congested urban area. If a 78-year-old guy can do it, then so can most San Franciscans. We deserve a safe way to get where we need to go just like everyone else. We pay taxes (often more than our fair share according to your rich white hipster stereotype) and we want infrastructure that caters to our low-cost, accessible form of transportation that doesn’t rely on fossil fuels and contributes to better health and air quality. Riding a bike isn’t a statement, it’s just a practical, environmentally future-generation-friendly thing to do. What a powerful anecdote — thank you. He has my admiration. Please do donate to the family. They largely depended on Cheng Jin Lai and now, while dealing with the pain of their tragedy, they also find themselves in a very difficult financial situation. The city failed to provide basic safety for its residents, but the community at least can support its members. George Gascon will never press charges here, he simply regards an elderly Chinese-Vietnamese immigrant life as having no value.